We get it... but no. Republican House Speaker John Boehner wanted to express his opposition to President Obama’s proposal for free community college for “responsible students.” So he did what anyone would do: He turned to Taylor Swift to articulate his response in GIF format. ICYMI: Here’s the announcement that the President made back on the 8th, which calls for thousands in tuition aid for students who maintain a 2.5 GPA and more. Still, 60 billion dollars is a lot of money…you can’t just shake it off. This is a program that would probably apply more to younger, traditionally college-age adults than older ones. 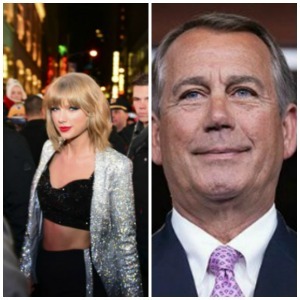 So we see where Speaker Boehner’s team was going with the Taylor Swift strategy. But it misses the mark for a few key reasons. Second, this is a serious issue and the tone of this response is off. Millennials are suffering financially because of the cost of going to college. But to be competitive in the job market, most everyone is opting for higher education. So while Taylor Swift resonates with this group, you have to question whether a listicle of GIFs is the most appropriate way to engage with this voting age demographic. But there is a problem: [Digital comms director Caleb] Smith’s goal was almost certainly irreverence, but the attempt at levity instead comes off as glib. And therein lies the danger of politicians using the medium of the moment to get their message across. From a messaging POV, it might have been better, for instance, to highlight the problems that Boehner sees with the plan, propose an alternative, and then, if they wanted to make a funny, supplement that with a tweet or something that uses a GIF to grab attention and drive traffic. Finally, the tactic muddied the message. Coverage of the Swift GIF-o-rama hasn’t debated the points that Boehner is making in the post. Rather, the conversation has revolved around the fact that he went this route to make his point. For instance, this is the headline from Business Insider, “John Boehner Trolls Obama With A Bunch Of Taylor Swift GIFs.” No mention of what Boehner is talking about at all. The strategy is fine. But the execution could use some fine tuning.